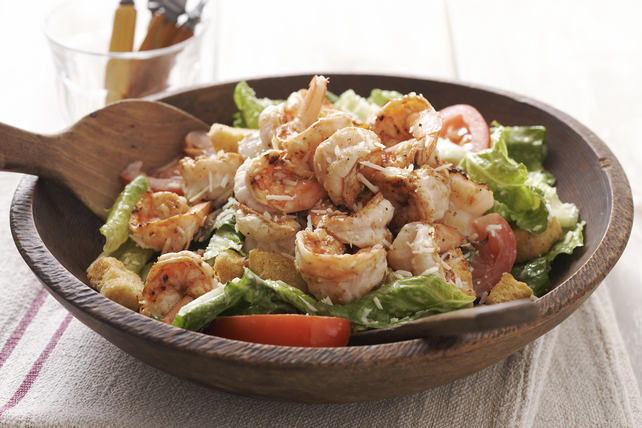 The whole family will love this savoury Caesar salad tossed with tasty grilled shrimp. Heat barbecue to medium heat. Mix 1 Tbsp. dressing, lemon juice and pepper in large bowl. Add shrimp; toss to coat. Grill shrimp 2 to 3 min. on each side or until shrimp turn pink. Toss lettuce with tomatoes, croutons and remaining dressing in large serving bowl. Top with shrimp and cheese. Substitute boneless skinless chicken breasts instead of shrimp. Grill 6 to 8 min. on each side or until done (170°F); cut into strips. The romaine lettuce in this tasty main-dish salad provides is an excellent source of both vitamins A and C.